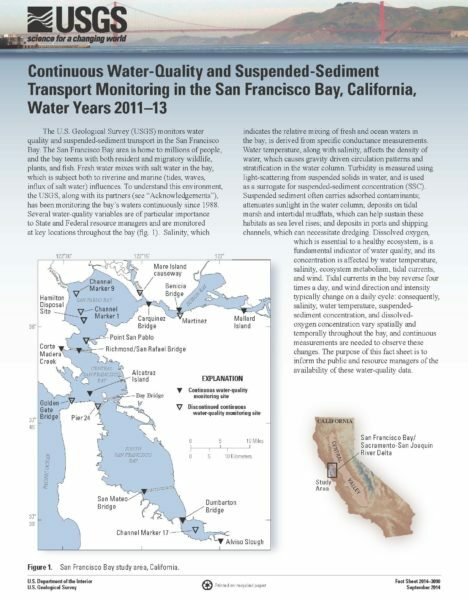 The U.S. Geological Survey (USGS) monitors water quality and suspended-sediment transport in the San Francisco Bay. The San Francisco Bay area is home to millions of people, and the bay teems with both resident and migratory wildlife, plants, and fish. Fresh water mixes with salt water in the bay, which is subject both to riverine and marine (tides, waves, influx of salt water) influences. To understand this environment, the USGS, along with its partners (see “Acknowledgements”), has been monitoring the bay’s waters continuously since 1988. Several water-quality variables are of particular importance to State and Federal resource managers and are monitored at key locations throughout the bay (fig. 1). Salinity, which indicates the relative mixing of fresh and ocean waters in the bay, is derived from specific conductance measurements. Water temperature, along with salinity, affects the density of water, which causes gravity driven circulation patterns and stratification in the water column. Turbidity is measured using light-scattering from suspended solids in water, and is used as a surrogate for suspended-sediment concentration (SSC). Suspended sediment often carries adsorbed contaminants; attenuates sunlight in the water column; deposits on tidal marsh and intertidal mudflats, which can help sustain these habitats as sea level rises; and deposits in ports and shipping channels, which can necessitate dredging. Dissolved oxygen, which is essential to a healthy ecosystem, is a fundamental indicator of water quality, and its concentration is affected by water temperature, salinity, ecosystem metabolism, tidal currents, and wind. Tidal currents in the bay reverse four times a day, and wind direction and intensity typically change on a daily cycle: consequently, salinity, water temperature, suspended sediment concentration, and dissolved oxygen concentration vary spatially and temporally throughout the bay, and continuous measurements are needed to observe these changes. The purpose of this fact sheet is to inform the public and resource managers of the availability of these water-quality data. As we rethink land management along the San Francisco Bay shoreline in the face of climate change, we know well-functioning resilient tidal landscapes can protect development and sustain native ecosystems. Here, we present a possible future vision for lower Novato Creek and adjacent baylands that includes several components that would restore and support natural processes, and, in turn, benefit aspects of flood risk management and ecosystem functioning. 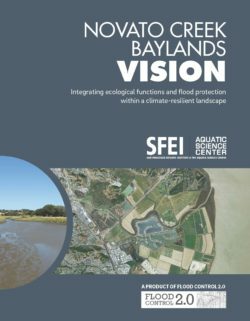 The Novato Creek Baylands Vision is an element of an EPA-funded project called Flood Control 2.0, which is aimed at advancing new approaches for flood risk management and habitat enhancement along the San Francisco Bay shoreline for the 21st century and beyond. The goal of this study is to develop a high level overview of the physical and ecological changes to lower San Francisquito Creek and the surrounding tidal marshes and mudflats (referred to here as “baylands”) since the beginning of intensive European-American settlement. Building upon a previous reconnaissance-level historical ecology study (Hermstad et al. 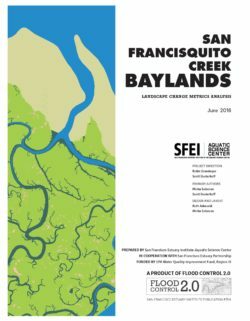 2009), this study analyzes the changes in key landscape features (or landscape metrics) within lower San Francisquito Creek and baylands through comparisons of reconstructed historical (mid-1800s) and contemporary (2011/2012) conditions. The results from this study are intended to provide baseline information that can be used to help with developing restoration and flood control redesign alternatives and appropriate habitat restoration targets. This study is one component of the Flood Control 2.0 project, a regional effort funded by the U.S. EPA to help design flood control channels at the Bay interface that support tidal habitats while maintaining the required level of flood protection. Emerging strategies for flood protection focus on reconnecting channels to floodplains and tidal marshes and using available dredged sediment as a resource to increase marsh elevations and help keep pace with sea level rise. Lower San Francisquito Creek is one of three implementation projects that have partnered with Flood Control 2.0 to assess the benefits of an integrated approach for flood control and habitat management at the Bay interface. 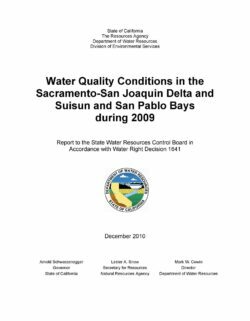 This report summarizes the results of water quality monitoring and special studies conducted by the Environmental Monitoring Program (EMP) within the Sacramento-San Joaquin Delta (Delta) and Suisun and San Pablo bays (the upper San Francisco estuary) during calendar year 2009. This monitoring is mandated by Water Right Decision 1641 (D-1641) and this report is being submitted to fulfill the reporting requirements of this decision. The EMP monitored water quality using a protocol implemented in 1996. Under this monitoring protocol, 13 sampling sites—2 of which were added after 1996—representing 8 regions of the upper San Francisco estuary (estuary) were monitored for 15 physical and chemical water quality parameters. The results gathered from the sampling of these 15 parameters are described in this report. Parameters such as water temperature, Secchi disk depth, dissolved oxygen (DO) concentration, specific conductance, dissolved inorganic nitrogen, orthophosphate, and volatile suspended solids were within their historical range. Measured parameters exhibited seasonal variation as well as changes in response to significant rainfall events and in flow rates. In addition to monitoring physical and chemical water quality parameters, biological sampling was conducted to monitor the productivity and community composition of phytoplankton, zooplankton, and benthic communities.